An unexpected, unscheduled day at home is a gift straight from heaven. (Literally, if it’s caused by snow or ice.) I get so excited contemplating possible projects while still lying in bed that there’s no sleeping in late. When one such day happened recently, I took the opportunity to make one of my youngest son’s favorite breads. He loves it for good reason. 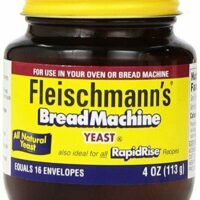 The yeast is allowed to develop slowly resulting in superb flavor, chewy texture and a close crumb. Begin by making a “sponge,” also referred to as a biga. Sponge sounds kinda gross but this mixture does look like a sponge after it rests for several hours. See the picture below. Flour, yeast and water after sitting for 8 hours. After the sponge has developed for 6-8 hours, add the remainder of the flour, water and salt to make the dough. I do it all in a bread machine, although it can certainly be made by hand or with a stand mixer if you don’t have a machine. With that in mind, I posted those directions in the notes of the recipe. Try making this bread the next time you find yourself with several hours at home. Yes, it requires a little more time than most homemade bread, but it’s not so much hands-on time. Rather, it’s the kind of time where you need to hang around just to keep an eye on things. Your reward for patience is a bread with better flavor that remains fresher longer. Please note: You won’t get big holes and spider web texture with this recipe. It’s not that kind of bread. If that’s what you’re after, check out my Ciabatta Bread. A sharp single-edge razor blade is the secret to this look. Place water, yeast and flour in bread machine pan and select the "dough" cycle. Allow to mix about 5 minutes using small spatula to carefully push flour stuck in the corners into the mixing area. Unplug machine and let stand at room temperature over night or about 8 hours. Do not leave over 16 hours. Open lid of bread machine and add water, sugar, salt, and flour. Restart dough cycle. 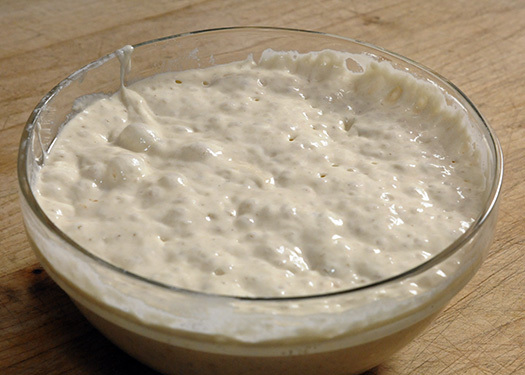 Check dough after 5-10 minutes of mixing. If necessary, add additional flour 1 tablespoon at a time to form a smooth but slightly tacky ball or water if dough is too dry and bounces against the sides. When dough cycle ends, allow dough to continue to rise in machine for at least 30 minutes (or more if ambient temperature is cool) until double in size. If you are new to bread machines, see Six Bread Machine Tips for Beginners for more help with this step. Remove dough from bread machine pan to lightly floured board or silicone baking mat (my preference). Form into smooth ball by pulling dough around to bottom until top is smooth. Place on parchment-covered cookie sheet. Cover loosely with lightly oiled plastic wrap and place in warm place to rise until almost double. About 15 minutes before bread is ready to bake, preheat oven to 425 degrees. Just before putting bread in the oven, sprinkle top with flour. Using a single edge razor blade (or a sharp, serrated knife), make several cuts across top of bread about 1/2 inch deep. Bake 30-35 minutes until loaf is golden brown and internal temperature has reached 190 degrees. Allow to cool on rack before slicing. Or slice while it's hot at the risk of squashing your bread. It's worth it. Follow directions above for making the sponge. Use a medium size mixing bowl to mix the sponge and let it sit for 6-8 hours. To make this recipe in a heavy-duty stand mixer, add sponge and other ingredients to the bowl in the same order. Turn on low to mix until all ingredients are moistened. Using dough hook, turn speed to 2 or 3 and continue beating/kneading until dough becomes smooth and elastic, about 5-10 minutes. Cover and allow to rise in a warm place. Deflate dough gently and shape rolls as indicated in recipe. Really love this bread and tidy experimenting with it as a pizza base…. Just wondering if I could delay second rise, after biga, in the fridge as I don’t want to bake it for ~8hrs (10am now). Would this be OK do you think? I haven’t tried it so can’t say for sure. Definitely think it’s worth a try. It would allow more time to develop the flavor for sure. Thank you Pia for coming back to leave a comment. Happy bread-eating! Paula, I am making the French Bread Today. I made the Sweet loaf bread yesterday. I am making pizza dough this afternoon. I just love making bread in my bread machine, Paula’s way. Thanks again for the tips, knead in the machine and cook in the oven. Hope you’re having a great day! So thank you so much and here’s hoping I can repeat my experiment! I am very glad I dared to be adventurous and didn’t just stick to baking in my machine for my first go. I have made the crust round bread three times. The first time it turned out perfectly and tasted amazing. The second time was for company…. it didn’t rise as much and afterwards was very thick and heavy… went over the recipe and couldn’t remember doing anything differently at all. Hello, I just wanted to say that I really enjoy your bread recipes (and website!). I made Crusty French Bread last week and am going to make Crusty Round Bread this week. I always get a ton of compliments when I make your soft garlic sticks! The Crusty French Bread is a family favorite. 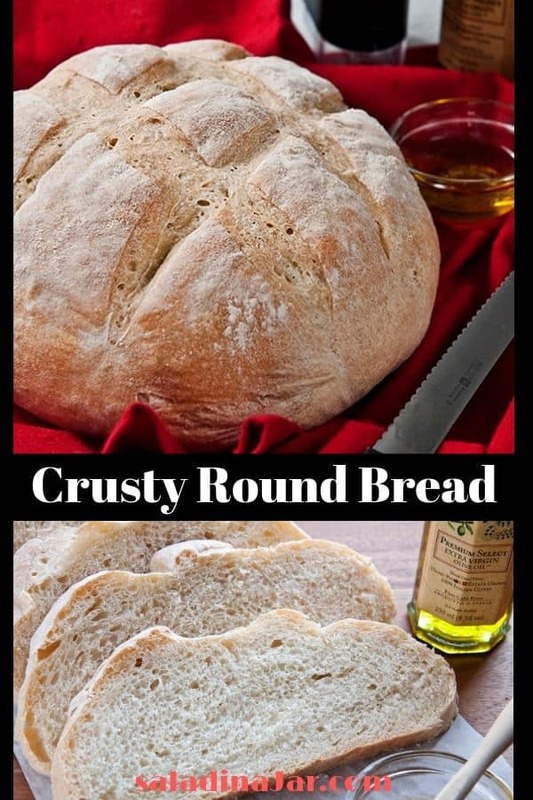 Hope the Crusty Round Bread turns out just as well for you. Thanks for writing. I’m using your recipe once a week with great success. I live in Northern California so I have to add vital wheat gluten or I get a door stop instead of a loaf. I can’t use salt so I’ve been experimenting with additives to get some great flavor. Today’s loaf has Parmesan cheese, fresh chopped rosemary, and a tsp of butter flavoring. The aroma is driving me wild. I’m striving to make Nancy Silverton (La Brea Bakery) type breads without all the work. I’m ooooold so the easier it is the more likely I am to do it. Thanks for a wonderful recipe. 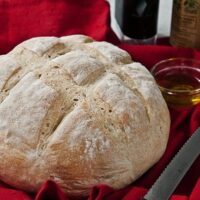 I love your bread recipes and have been working through them since I came across your site. 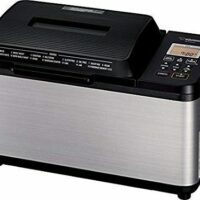 I’ve got tendonitis in my forearms and slightly arthritic fingers, neither of which can cope with kneading any more, so this is how I use my bread maker too – to do all the heavy lifting in preparation. I hadn’t seen this version of italian bread before but it makes great sense to use the machine to knead then store the mix (biga, preferment, whatever!) overnight with no messing around between bowls. I NEVER KNEW I COULD MAKE SUCH DELICIOUS BREAD! Thank you for this recipe and instructions. I made my first loaf today and it turned out AMAZING! I may never set foot in the Whole Foods bread section again! Your first loaf? Congratulations!! Glad it worked for you. Hi again. So, I have successfully made this bread twice. It is gorgeous and delicious and makes me so happy. BUT. 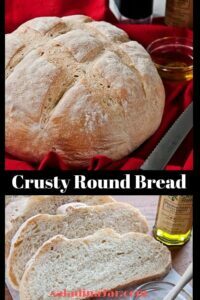 In both cases I have what I think is mold on the bottom of the loaf. They’re just like dark-ish spots, only on the underside. With the first loaf, I just ignored them, figuring it was a weird fluke and it couldn’t possibly be mold. But the same spots appeared the second time. Is it possible that mold is growing on the underside of the loaf, during the rising period? Maybe I’m allowing it to rise for too long? I’m letting it rise for many hours, like 4 or 5 hours. Is that too long? Also, I put it to rise in the bathroom, which is the warmest room in the house. Maybe it’s just to warm and/or humid in there? Has this ever happened to you? Any thoughts or ideas for me? Thank you! Can I use whole wheat flour to make this ? I haven’t tried using whole wheat in this particular recipe. You might swap out one cup and see how it goes. Dear Paula, Is sponge bread same as a sourdough bread? Not exactly. Some people call sponge bread the “poor man’s sourdough.” Sponge bread has somewhat the same texture as sourdough but is not nearly so sour. I love both. 1. Let rise on a large square of parchment paper, cover dough w/ plastic wrap. 2. At final 30-40″ of rise, place a round 8 qt Dutch oven w/ lid into 475F oven. 3. When dough is ready and slashed, remove 475F Dutch oven from oven. 4. Carefully/rapidly remove top, and holding bread by edges of paper ‘sling’, plop into Dutch oven, quickly place top back on. Minimize length of this step., you want oven to stay hot. 5. Bake on top 1/3 of oven for 30 min w/ top on. 6. Bake w/ top off, another 30 min or until temp is 190-200F. Enjoy the crunch! Can’t wait to try this Ellen. Reminds me of No-Knead Bread. This bread is amazing. It doesn’t last long when I make it! Hi Paula, in this recipe you say all purpose unbleached flour – is that the same as bread flour? I am in the UK and we have the bread flours (wholemeal, strong white etc) and then normal flour – either plain or self-raising. For the dinner rolls and the pizza dough I used Strong white bread flour, will this work for this bread too? Also in stage 1 of preparing and baking – how long does it usually take to double in size? Bread flour has a little more protein and gluten than all-purpose flour but bread flour will work fabulously in the recipes you mention. 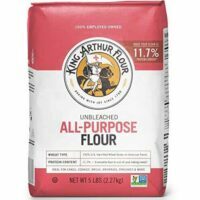 Our all-purpose flour is probably the same as your “normal” flour although I don’t know that for certain. I do the first rise in the bread machine on the dough cycle so that takes 1 hour and 30 minutes. But machines vary. The second rise after I have formed the dough also varies–anywhere from 30-50 minutes depending on the room temperature, kind of dough and how it is formed. Hope that helps. Thanks, will stick to the bread flour then. Yes my machine takes about the same time to do the kneading and rise. For the dinner party rolls I only left them about 15 mins for the second rise…but in my warming drawer which seems perfect for it. Will let you know how it goes! I just finished making this bread and it was fabulous. We all loved it. Thank you again, so very much. You bring me and my family so much joy! THANK YOU, THANK YOU, THANK YOU Paula!! I have tried way too many recipes to mention for that great crusty edge, to no avail until your recipe. The bread was amazing! Super easy, literally two minutes hands on time, I will try to shape into a bagette next time for an even crunchier crust ( I know I am a breadie- like a foodie, but bread is my it food) So keep the awesome recipes coming! It just came out of the oven-looks beautiful, sounds hollow-can’t wait for the loaf to cool. A note on the biga (or whatever it’s called :-))…..
For an even more complex flavor, you can make the biga in a separate container (I use a plastic food storage box that holds at least 8 cups volume), let it do it’s thing at room temp for 12 hours or so, then put in in the fridge for up to three days before you use it. If you were making by hand, you’d want to let the biga warm up before continuing with the recipe, but the bread machine warms it up for you in the initial stages. Made this bread last night with a 2 day old biga (fermented about 12 hours; in the fridge the rest of the time) and it was awesome! I need to dig out my bread stone so I can get it even crustier. That is one beautiful loaf of bread. This fabulous loaf looks like it came straight from a Parisian bakery! Yum!! beautiful looking loaf of bread! What beautiful bread! I love the scored pattern on top, and you make it look so easy. (I know it’s not because the dough resists being cut!) Also love your new profile pic. Hi Gaye, I just now got what you mean about the dough resisting being cut. A little slow here. Actually, it can be somewhat resistant if it wants to stick to the razor. Have to dip it in flour when that happens. Oh.My.Word! Just the photos have me drooling! I could literally make a meal off of some of this with a glass of wine. Oh yes! Looks just like it came from a bakery! I remember making italian crusty bread back in Seattle – I bought unglazed tiles for the oven and sprayed the bread down with a mister…. well worth the time and effort – but this looks even easier! I love that criss-cross pattern with the razor. It gives it such a professional look – and speaking of look – looking forward to the gumbo recipe! No snow days here yet this year, and with last week’s 70 degree temps I’m beginning to wonder if we will have one! I do have Monday off though, and it would be the perfect day to try this. (I’ll have to write myself a note to start it tomorrow night.) I’ve never used this method with a bread machine- sounds delicious! Ohhhh, Paula….your bread looks heavenly!! Wow. Beautifully done…have never made bread before. Photos are fantastic. Amazing looking loaf! Thank you for posting! Smart kid! I wish my parents had made me homemade bread… I love the way preferments can give bread that almost-sourdough flavor that’s just enough to make you wonder. looks yummy! i can see why this is brett’s favorite!